German, French, Italian, Romansch. These are four distinct Swiss cultures that are peacefully entwined with each other. As rich and varied as its magnificent countryside, so are the cultures of Switzerland that make up its diverse population. Few countries in the world have so much variety in language and customs. You will also find a fascinating mix of traditional and contemporary elements, which add to the excitement of discovery for travelers. German is prevalent in Zurich and the northern, central and eastern regions. French is spoken in Geneva and the Western region. Italian is the language that is spoken in Lugano and the southern region. And Romansh (an Indo-European language) is spoken in St. Moritz and the southwestern region. Between the French flair for drama, German need for precision, Italian outburts of passion and Romansch unflappable calm, you might expect to find competition or conflict between these different people. Yet, despite its varied cultures and linguistic differences, Switzerland is one of the most politically and economically stable countries in the world. The nation’s neutrality and laws of political asylum have made it a magnet for many creative minds. Writers Thomas Mann, Stefan George and Ignazio Silone all fled to Switzerland during wartime to find safe harbor. Contemporary architects Aurelio Galfetti, Luigi Snozzi and Mario Botta, have also left their mark in the country. As far back as the middle ages, the cultures of Switzerland were exposed to greatness in architecture, art and music. Grand old buildings and churches are everywhere and, without question, touring vacations for art lovers can be planned around the hundreds of museums and galleries that exist throughout the country. There are theatres of varying sizes in the German, French and Italian speaking areas plus a surprisingly large number of professional orchestras and music ensembles. The work of both German and French speaking filmakers is internationally recognized. During the festival season you can enjoy many high-class music, dance, film and theatre performances. 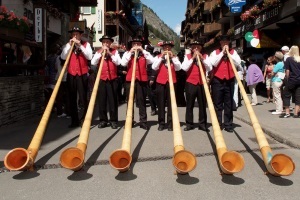 A thoroughly enjoyable way to experience Switzerland’s cultures and customs is in the many popular festivals. One example is the cheerful “Alpine dairy farmers’ fair (“Aelplerchilbi”), complete with yodelling choirs and banner waving. Hiking to those places will be very enjoyable. The international music weeks in Lucerne, the Montreux Jazz Festival, the Yehudi Menuhin Festival in Gstaad, the film festival in Locarno and dance days in Bern are just a few of the wonderful Swiss festivals held annually. Each new season brings a new display of Switzerland’s various cultures. Spring is the season of large fairs, including the International Motor Show, great exhibition of luxury watches in Basel and Geneva. Exhibition of Inventions and Fair for Books, Press and Multimedia. Summer is highlighted by open air events including the Geneva Festival and the Swiss National Day Celebration. Fall brings the Batie and Grape Harvest Festivals and the Geneva fair, while winter highlights include the Christmas Tree Festival, the International Christmas Market and the Escalade Celebration. No matter what time of year you plan to visit, your stay will be enhanced by a wealth of pleasure and entertainment that reflects the color and diversity of Swiss culture. So What’s The Weather Like In Switzerland For Walkers And Hikers Alike? When you are going on a hike, it’s important to get an idea of what sort of weather to expect. It’s no fun going in expecting sunshine and getting rained on. You will have to be prepared. Next to good walking shoes (check here to see the women’s, or here to see the men’s) and/or boots (check here to see really good ones), it’s important to wear the right clothes for the right weather conditions. Also be sure to bring an extra set, in case something happens to the one you are wearing. Discussing the weather, for many Swiss people, is the ideal topic of conversation when they meet and get to know other people. The Swiss like speaking about the weather. Abroad, from experience and the comments that I have heard, many people think that this country is covered in snow throughout the year and this possibly because of the numerous photographs and advertising on Switzerland. The best season for walks and hikes through Switzerland is certainly between the months of May and October. This all strongly depends on where exactly you’re planning to go for hikes. Spring arrives much quicker in the south (Ticino) of the Alps than in the north. Personally, I have already gone on hikes in the southern parts and enjoyed the sunshine from the month of May. Hiking vacations are great too in southern Switzerland. The weather in Switzerland, in meteorological terms, is known as a moderate climate. You will not find very high temperatures or lots of humidity in the air as is the case for the countries just south of us. The cold weather is supportable and isn’t remotely identical to the very cold weather that you could find in northern Europe. The coldest weather is during January and February, with snow falling right down to the Swiss plain. During the daytime, the temperatures vary between 28 and 45 degrees Fahrenheit. In the springtime, the temperatures vary between 46 and 59 degrees Fahrenheit. In summertime, Swiss temperatures are between 65 and 82 degrees Fahrenheit, during the daytime. Should you be in the mountains during this particular season, think of taking a light jacket or jersey with you. The evenings are quite cool, even in summertime. Concerning the Swiss weather, you will notice that the higher up you go, the cooler it’s going to be. There is a close relation between the altitude and the temperature. Locarno, in the south of Switzerland, is a region that the Swiss call “the sun room”, is at 1640 feet above sea-level with a moderate temperature of 52 degrees Fahrenheit. If you take the complete opposite, then that would be the Mountain of “Weissfluhjoch” in the canton of Grison (centre for the research on Avalanches). The summit of the mountain is at 8200 feet above sea-level. The temperature is always around 27 degrees Fahrenheit! You can say what you like about the Swiss climate but one thing is for sure, once the sun makes its appearance, it does tend to get very sunny indeed! Sunburn is very easily obtained. Especially during hikes and walks through the mountains where the last patches of snow are stubbornly melting in the summer sun. The sun reflects very strongly off these patches and it is advised to wear good sunglasses and to pack in an excellent sun protection cream. Here, you will find a calculator for the conversion from Fahrenheit to Celsius: Evidently, there is also rain. But whether you run into any, kind of depends on where you are hiking (and where to). Studies have shown that there is no relation between the altitude and the precipitations. The “Pilatus” mountain gets about 70 inches of rain per year and the town of Visp up to 32 inches. An umbrella or a good raincoat should definitely be included in the equipment you are bringing on your walks and hikes. I can tell you this from personal experience. Very particular to the Swiss climate, there is a wind called the “Föhn”. This phenomenon occurs when coming from the south, the clouds are blocked in the Alps and forced to cool the region down. This friction then heats up the clouds and results in a southern wind that is very warm. Some people get headaches from this. Every time, when the “Föhn” blows, I was able, from my vacation home at the time, to see the Alps very clearly. It almost gave me the feeling that I could reach out and touch them. The view is just that clear! I wish you a lot of pleasure during your walks and hikes in Switzerland!